Tune in during classical programs this week as we celebrate American conductor Lorin Maazel, who passed away on July 13th at the age of 84. Mr. Maazel was a child prodigy, making his conducting debut at the age of 8, and touring to conduct major American orchestras by the age of 12. 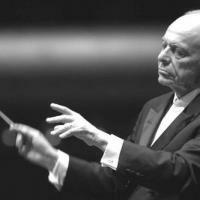 As an adult, Maazel led many of the world's most prominent orchestras, serving as principal conductor of the Radio-Symphonie Orchestra (RSO) Berlin, the Cleveland Orchestra, the Vienna State Opera, and the New York Philharmonic. He was noted for intensely emotional and variable performances, as well as bold artistic management over his orchestras which drew both critics and ardent fans. Normally scheduled classical programs from Tuesday, July 15th through Thursday, July 17th, as well as Saturday Night at the Opera on July 19th,will feature works conducted by Mr. Maazel.